View More In Desiccators & Accessories. Dimensions LxWxH: 11" x 4" x 7"
SVac chambers are not compatible with stabilization resin (i.e. Cactus Juice, Gator Venom, Minwax etc. ), acetone, acrylic based monomers or polymers. The lid may be cleaned with soapy water and low strength cleaning agents. Customers using solvents such as stabilization resins (MinWax, Gator Venom etc. ), alcohol and other polar solvents must use the vacuum pumps in conjunction with a cold trap for evacuations in excess of 5 minutes. (Excludes Cactus Juice) If the consumer is using the pump for prolonged periods of time exceeding 5 minutes we require that a cold trap is used or the pump warranty is void. These stabilization resins have the ability to break down the internal components of the pump that are plastic resulting in a seized motor voiding all warranties. User friendly vacuum connections that fit most vacuum pumps on the market. 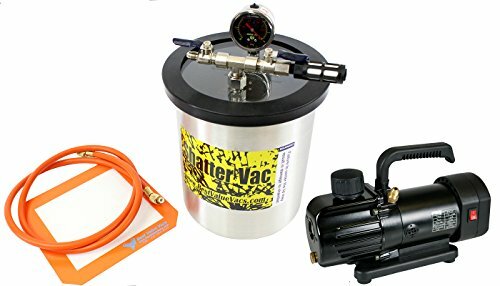 50 Micron Air Filter, Silicone Vacuum Pad, and 5' Vacuum Rated HVAC Hose to pull a vacuum included. Lightweight, Rubber Feet for noise dampening, Reliable, Economical and Efficient.